I haven’t posted about it on my blog yet (yeah I’ve meant to and still plan to) but I am a Google Glass Explorer. I’ve had my glass for just over three months now and it really is incredible. I don’t want to focus too much on why I think it’s a great device or what I commonly use it for (I’ll try to post about that soon) but instead want to focus on something I’ve spent the last few nights working on. As you can probably tell if you look at my recent entries on this site, I do a lot with Windows Azure. More specifically, I do a lot with Windows Azure Mobile Services. You can sign up for a free Windows Azure trial here. You can read more about developing with Mobile Services for free (even after the trial) here. If you haven’t looked at what Glass offers as far as development options go, there are two things that have been announced: the Google Mirror API and the Glass Development Kit (GDK). The GDK is a forth-coming kit that will enable developers to build applications that run on the actual device itself. We won’t be touching on the GDK today. 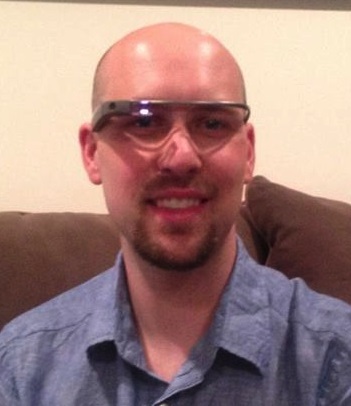 The Mirror API is Google’s way of allowing you to deliver information to Glass. The way it works it that you get a token when identifies your application and the Glass device you want to interact with. With that token you can ask the Mirror API to deliver information to that Glass device. This isn’t all together different from how Push Notifications work (with GCM or any other major push provider). However, there are many more additional options when it comes to delivering information to Glass. Today we’re only going to deal with the basics of delivering some text in addition to a few options that we can pass along. How do I test this myself? While I can walk everyone through the steps I used to talk to my Google Glass, as of today, not everyone will be able to do the same. In order to test out development with the Mirror API, you have to request access. 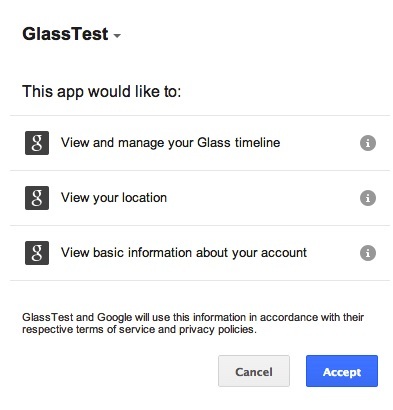 As far as I’m aware, in order to request access, you need to have Glass (or someone that has Glass and access can grant you the ability to use their Google API Project that has access to the Mirror API). In short, very few people will probably be able to make use of this today. However, that number will grow and it’s not a bad idea to understand how these things work so down the road you can easily consume them. In the next screen, use whatever name you want and then click Next. Leave the Application Type as Web Application and for the site or hostname, you’ll enter something like this: http://glasstest.azure-mobile.net/api/glassauth. In this case, glasstest is the name of my Mobile Service (so change that to match your Mobile Service). glassauth is the name of the custom API I’m going to use to authenticate. After entering that, you can click Create client ID. In the screen that follows, you’ll need to copy the Client ID and Client secret. With that step done, we can move on to our Mobile Service. After the user clicks Accept then the user is redirected back to our custom API (due to the redirect_uri property we specified). refresh_token - this token can be used to get new access_tokens (when they expire) without the involvement of the user (only granted because we used the access_type of offline in our initial auth / permission request. We could stop here and just save the user’s access_token and refresh_token. We only need to push to the Mirror API with the access_token and get a new token with the refresh_token whenever the access_token expires. However, as you might imagine, it would be nice to be able to tie the tokens we have back to a specific user. In order to do that, we need to get a user ID. 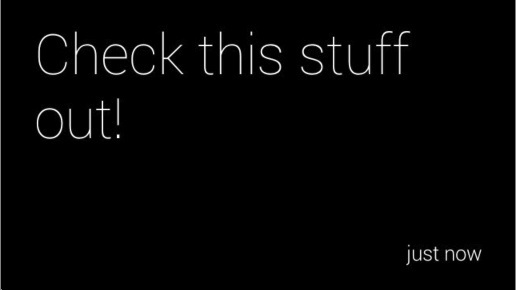 Sending text over and specifying a notification and the ability to delete really just scratches the surface of what you can send to Glass. There are tons of different options for what you can send over and how Glass can then interact with your card. You can read more about the different options for inserting to the Glass timeline here. One of the great things to note is that, with the exception of sending actual media data over (bytes), everything is just JSON. This means it’s super simple to send this stuff from a Mobile Service script. Even the media can be sent over, it’s just a little more work than I’m demonstrating here. The Mirror API is the only official way you can currently send information to a Glass device. Thankfully, interacting with it is pretty straightforward and is built off of very common standards: JSON, OAuth, HTTP, REST. While there are quick starts for interacting with Glass in several languages (currently Go, Java, .NET, PHP, Python, and Ruby), you should be able to talk to Glass from many other languages and platforms if you want. Mobile Services is a backend-as-a-service that exposes tons of great functionality regardless of if you’re building a mobile app for Android, iOS, Windows Phone, or the Windows Store or if you’re building a web site, console app, or anything else. Being able to talk to Glass from Mobile Services is pretty simple as well. Maybe one day, down the road, pushing to Glass will be built into Mobile Services just like push notifications are for the other platforms (this is actually quite realistic since you just need to do Google Auth (which is built into Mobile Services) and maintain a token). I hope this helps you think about new ways of delivering information to different devices and expands what you think Mobile Services is capable of.